One of my New Years resolutions it to get back on track with blog posts. So here it is the first Makeover Monday of the New Year. The next room Erik and I want to focus on in our home is the kitchen. The redecorating of this room isn't going to be as easy or as fast as our front room. It includes big purchases that we will have to make over time such as a new fridge, new counter tops, a new dining table, etc. We have already discussed how we want it to look so here is the first concept design for the kitchen. It is for the wall to your right as you are walking in. Currently the only thing there is a fridge that we got for free from Erik's previous job. 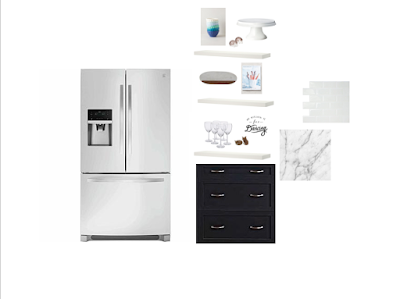 I would love to eventually have a nice stainless steel fridge. Next to it I would like to add another cabinet. Most kitchens are designed this way but for some reason our kitchen just has empty space next to the fridge. By adding a counter top we gain more storage room inside the cabinet and on top. This will most likely be where I drop the mail and my purse everyday. We want to replace our current laminate countertops with granite. I love the look of the white and gray marbled granite. I think it really ties the color scheme together. Above I want to add some open shelves to display some of our cuter kitchen items. I don't know why I am so obsessed with open shelving but get ready to see a lot of it. We are going to keep the kitchen walls white and Erik has already repainted them and it makes the room feel so much brighter. We also want to add some subway tile to our back splash. I absolutely love that cooler colors are more popular nowadays because they have always been some of my favorites. I feel like they add a calmness and coziness to your home. What are your favorite colors to decorate with?